When Pope Francis and his friend Rabbi Abraham Skorka of Buenos Aires met in Argentina in 2014, they began plans for a statue to be made to commemorate the 50th anniversary of Nostra Aetate, the Vatican II document that changed the relationship between the Catholic and Jewish faiths. St. Joseph’s University chose Philadelphia artist Joshua Koffman to create the statue, “Synagoga and Ecclesia in Our Time,” which is mounted in the plaza in front of St. Joseph’s Chapel on the school’s City Avenue campus in Philadelphia. It was dedicated on Friday, Sept. 25 and when the Pope visited the statue two days later, he blessed it and sprinkled it with holy water. The very same artist, Joshua Koffman, has been commissioned by Friends of Percheron Park to sculpt the statue of Diligence, the Percheron stallion who was brought to the USA from France in 1839 by Moorestown native Edward Harris II, to improve the work horses in this country. The life-size statue of this handsome horse will be the centerpiece of the commemorative Percheron Park at Main and High Streets in Moorestown’s Town Center, just steps from Harris’ home, the Smith-Cadbury Mansion, now the headquarters of the Historic Society of Moorestown. Although soil remediation at this site of a former gas station is delaying the project, first envisioned in 2007, Friends of Percheron Park are hopeful that construction of the park might begin in the spring of 2016. 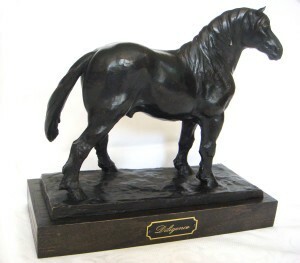 Limited edition 10 inch bronze replicas of the Diligence statue may be ordered from Friends of Percheron Park. Those who purchase this striking heirloom-quality piece will be helping to support the park. Contact Margo Foster at (856) 235–5862 for information about ordering the Diligence model.